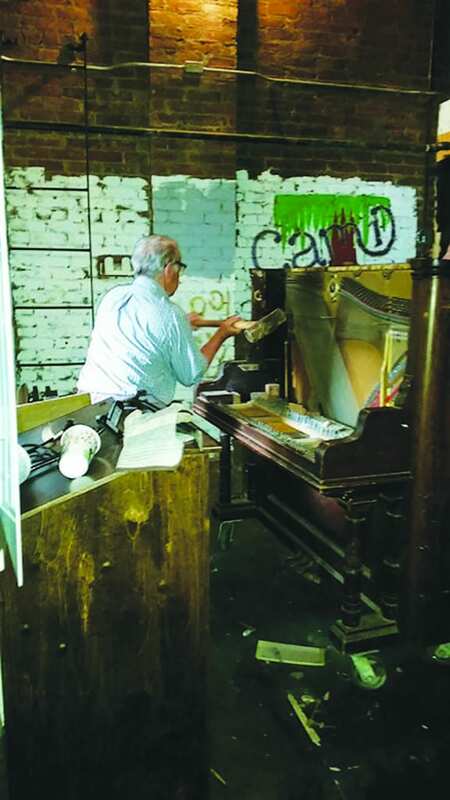 LUDLOW—After advertising its availability at no cost for six months on social media, Front Porch Forum and news releases, the Friends of Ludlow Auditorium (FOLA) decided it was time to dismantle a very old and somewhat out-of-tune piano stored back stage in the Ludlow Town Hall Auditorium last week. So, armed with hammers, saws, screw drivers, and a heavy sledgehammer, three members of the FOLA board of directors, Jim Alic, Martin Nitka, and Harry Welch, began the process of tearing down the very old and somewhat decrepit instrument. Bystander Ralph Pace said, “It seemed terrible to destroy such a musical instrument but that the piano took up space in the auditorium’s back stage that was desperately need for FOLA’s new development efforts.” He added that, since no one wanted the piano, there was little alternative to its dismantling. Marty Nitka, realizing the difficulty in tearing down the old instrument, decided that an old-fashioned sledgehammer was needed, which he utilized with accuracy and talent. Meanwhile, Jim Alic and Harry Welch made sure that the weight of the falling piano did not disrupt any town equipment. After an hour of labor, the bulk of the separated pieces of the once-intact piano were loaded into Alic’s pickup and disposed of at the town transfer station. Marty Nikita takes a sledgehammer to an unwanted piano at the Ludlow Auditorium last week.